¿This resource provides the necessary background in mechanics that is essential in many fields, such as civil, mechanical, construction, architectural, industrial, and manufacturing technologies. The focus is on the fundamentals of material statics and strength and the information is presented using an elementary, analytical, practical approach, without the use of Calculus. To ensure understanding of the concepts, rigorous, comprehensive example problems follow the explanations of theory, and numerous homework problems at the end of each chapter allow for class examples, homework problems, or additional practice for students. 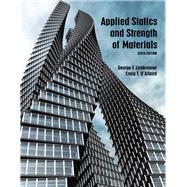 Updated and completely reformatted, the Sixth Edition of Applied Statics and Strength of Materials features color in the illustrations, chapter-opening Learning Objectives highlighting major topics, updated terminology changed to be more consistent with design codes, and the addition of units to all calculations. George F. Limbrunner is an alumnus of Rensselaer Polytechnic Institute and Professor Emeritus of Civil Engineering Technology at Hudson Valley Community College where he taught structural engineering for 38 years. Craig D’Allaird is a licensed professional engineer in the state of New York with 15 years or experience in structural, geotechnical and architectural engineering. ¿Craig is currently an Assistant Professor of Civil Engineering Technology, Construction Technology and Architectural Technology at Hudson Valley Community College in Troy, New York. ¿Craig is an alumnus of Rensselaer Polytechnic Institute where he earned Bachelors and Masters of Science degrees in Civil Engineering, as well as Hudson Valley Community College where he earned an Associates of Applied Science degree in Civil Engineering Technology with an emphasis in Architecture. Craig is a Member of the American Society of Civil Engineers as well as a past member of the National Society of Professional Engineers.